SB-190 can be used with plastic, PVC, fiberglass, metal, vinyl, glass, painted materials, cement, brick and even wood. 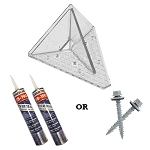 It is not recommended to use it with copper or soft expansion joints, polystyrene or styrene containing plastic. 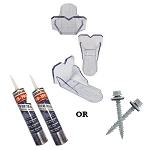 Adhesives do not last on copper or lead. 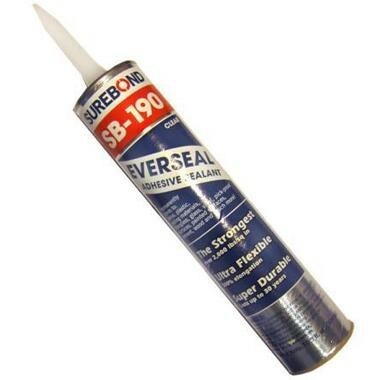 Tips for using SureBond SB-190 When using SB-190 Everseal here are some things to keep in mind. When bonding items that may slide before a full cure is set, tape the item in place or tie it down. An example would be installing snow guards on a steep roof on a hot summer day. Simply tie a string behind the snow guards across the entire roof, or tape each one to the roof. Clean both surfaces with Xylene / Xylol or ispropyl alcohol to make sure there is not dirt or oils. Make sure paint is completed dry before attaching to a painted surface. Also, wait for a full cure before painting the adhesive. Keep the cartridges around room temperature until just before it is applied. 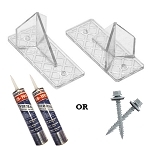 This will allow you to push the adhesive out a little easier. Cut a 1/4" slanted hole in the nozzle for best flow of the product. Do not use on copper roofs. Copper seems to prevent any adhesives from maintaining a good bond. Store unopened in a cool, dry room above 40 F.
Apply a uniform bead with steady pressure. Put items in place immediately after applying. SB-190 starts to skin over after about 20 minutes. I've used this stuff for several snow guard installations. Only thing to watch out for with it is to make sure you have enough warmer days otherwise it won't cure and your snow guards will come sliding off the roof with any weight behind them.